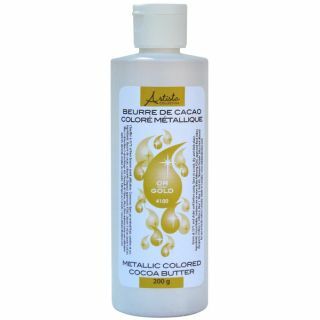 Ease your work with ready-to-use metallic gold colored cocoa butter. Obtain an identical coloring with each use. The metallic gold colored cocoa butter can be sprayed (gun or airbrush), applied with a paintbrush or added into the masses to be colored. Weight: 200 grams (7 oz). Ingredients: Cocoa Butter, contains one or more of the following FD&C approved food colors (lacquers)(Yellow 5, Yellow 6, Blue 1, Blue 2, Red 40), Titanium Dioxide, Mica. Not allowed for use in foods sold in Canada). Warm at 35°C (95°F) and shake well before using. Apply directly on chocolate mould with fingers, paint brush, Spray Gun or airbrush. Apply on plastic acetate film to create your own transfer sheets by using fingers, paint brush, Spray Gun or airbrush. Spray Gun on frozen desserts to create a colored velvet effect. Spray or airbrush on fondant. Spray or airbrush on cake icing. Add a little to butter cream or vanilla cream to color them.